On Monday, Prime Minister Jacinda Ardern announced that Cabinet had approved a Royal Commission of Inquiry into the Christchurch shooting. It was established by the Governor General through an Order in Council. Supreme Court Justice Sir William Young has been appointed to lead the inquiry and an additional Commissioner is expected to be engaged by the end of April. The Inquiry, which has been allocated funding of $8.2 million to carry out its work, is scheduled to start considering evidence from May 13th. It is expected to report back to the Governor General by December 10th 2019. The Cabinet Manual explains that under the Inquiries Act, three types of inquiry are available to a Government. The most commonly used government inquiry deals with issues where a quick and authoritative answer is needed. An independent inquirer is appointed by Ministers, who receive the final report. There is no requirement for the report to be publicly released. A public inquiry, on the other hand, is independent of the Government. Established by the Governor-General through an Order in Council, it is used to investigate wide-ranging issues of serious public concern. The final report is presented to the Governor-General and is tabled in Parliament. A Royal Commission of Inquiry, which is the most serious statutory response available to a Government, is used to investigate matters of grave public importance and difficulty. Such an inquiry, which is independent of the Government and reports directly to the Governor-General, focusses on fact-finding – investigating why the situation came about and recommending a range policy or legislative responses. While the Prime Minister originally indicated in the days after the Christchurch attack that an internal investigation would be carried out, it quickly became obvious that for an event of this magnitude, an independent Royal Commission of Inquiry was needed. While the Government is able to establish the terms of reference for the Inquiry, setting out the matters to be examined, it is the Chair – a High Court judge appointed by the Governor-General – who determines the way the investigation is run. The Government cannot interfere in the direction taken by the Inquiry or influence its findings. A Royal Commission has significant powers including that of compulsion in regard to witnesses, documentation and awarding costs. This enables it to uncover information that might otherwise be difficult to obtain. Public hearings usually play a crucial part in the inquiry process. It is important to understand that the findings of a Royal Commission, are not, however, binding on a Government. The Young Inquiry has been directed primarily to examine what state sector agencies – in particular the Government Communications Security Bureau, the New Zealand Security Intelligence Service, the Police, the New Zealand Customs Service, and Immigration New Zealand – knew about the activities of the alleged shooter Brenton Tarrant before the 15 March 2019 attack, what actions, if any, were taken in light of that knowledge, whether additional measures could have been taken to prevent the attack, and what state sector agencies can do to ensure such occurrences do not occur in the future. The Commission will investigate the accused’s activities in Australia, his arrival and residence in New Zealand, and his travel within New Zealand and overseas. It will determine how he obtained his gun licence, weapons and ammunition. His use of social media and other online activities will be investigated, along with his connections with other people – in New Zealand and internationally – including what government agencies knew about him and his activities. The Commission will also examine whether there are any impediments restricting the ability of New Zealand’s state agencies to gather and share intelligence. Further details about the Inquiry can be found on the Department of Internal Affairs website. Meanwhile the Government’s controversial firearms legislation has now been passed by Parliament, even though some of the knee-jerk changes are so extreme, that under normal circumstances they would have been regarded as unacceptable. Hasty legislation was not needed. An Order in Council had been signed by the Governor-General six days after the tragedy to effectively ban the type of semi-automatic weapons used in the attack, along with large capacity detachable magazines. Since the Order did not expire until 30 June 2020, this would have given the Government plenty of time to respect the democratic process and usher in properly considered changes to our firearm laws. In fact, it remains bizarre that as recently as January, the Prime Minister trusted New Zealand gun owners so implicitly that she changed the law to allow most of the administration involving firearms to be carried out online, instead of requiring face to face visits to Police Stations. Yet now, as a result of the actions of a lone foreign national, she has imposed oppressive restrictions that treat Kiwi gun owners as if they are potential terrorists. There is no threat to justify the reckless speed with which this complex legislation has been rushed through Parliament. It is illogical and undemocratic. He claims the Prime Minister was being deliberately “disingenuous and misleading” when she said, “Military style semi-automatics and assault rifles will be banned in New Zealand under stronger new gun laws announced today”, since fully automatic ‘assault’ weapons have been illegal for decades for civilians, even on a military firing range under military supervision. The editor of the publication, Graham Carter, believes that the Prime Minister was “electioneering”, using language designed to create mass hysteria and turn the public against legitimate gun owners. Graeme Edgelar, a Wellington barrister with a keen interest in law reform has been concerned about the expansion of the ‘Henry VIII’ clause in the new law, that would allow the Government to change criminal law through an Order in Council instead of having to go through Parliament. (e) declare any ammunition to be prohibited ammunition for the purposes of this Act. The Christchurch attack is also being used to justify changes to ‘hate’ speech laws, even though over the years there have been few prosecutions and therefore little evidence that the present laws are failing. Yet to appease the Greens and the left-wing of Labour, Andrew Little is fast-tracking a review of New Zealand’s hate speech legislation. Whether he intends to criminalise views that the socialist elite do not agree with remains to be seen. If it was the goal of the Australian shooter to disrupt life in this country, he has certainly succeeded. If he wanted to create division within New Zealand society, he has achieved that too. In contrast to the Norwegian response to a mass shooting in 2011, where the Government decided the attack should not harm their democracy and that people should not live in fear, our Prime Minister’s scaremongering – to justify her crackdown on gun owners – has contributed to a growing hysteria in New Zealand. All across the country, RSA’s are cancelling their traditional ANZAC Day commemorations over security concerns, even though the Police say there is no threat. There have also been calls for the name of the Christchurch-based Super Rugby franchise, the Crusaders, to be changed. Their name was chosen in 1996, to reflect the English heritage of their region, with their brand incorporating the popular pageantry of knights and horsemen of medieval England. But New Zealand Rugby is concerned that the ‘Crusaders’ name and symbolism, which is associated with the religious Crusades between Christians and Muslims could be considered offensive and it’s investigating whether it needs to be changed. While team management says the status quo is ‘no longer tenable’, many fans believe they are over-reacting. And while some of the victims of the Christchurch tragedy are calling for change, others like Linwood mosque survivor Abdul Dean, whose uncle was killed in the attack, are calling for calm. A keen rugby fan, he believes the Crusaders’ name should not be changed. Asked in a radio interview about the name change, he said, “I’m a true supporter of Crusaders and I don’t think it’s any sport’s fault or any one’s fault.” He believes there is absolutely no need to change the name, and that those officials who have responded to the criticism by saying that the name must be changed are feeling ‘too much guilt’ over the incident. The marketing company Research First has been commissioned to assess public feedback on whether the name and branding should be changed – you can have your say HERE. Their recommendations will be presented to the Crusaders and NZ Rugby boards by the end of the 2019 season. 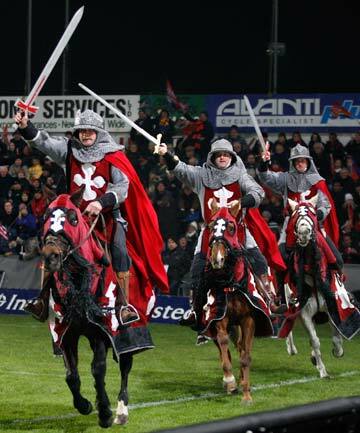 As a result of the Christchurch tragedy, do you think the Crusaders should make any changes to their name, branding, or imagery? The Crusaders name must stay. Their heritage represents the freedom that was forte for 1000yrs ago, & has been fought for in many wars, including two world wars Then along comes ‘Cinders’ with her, “I rejected Christianity, & I think the whole world should” mentality. Her statement, ‘THEY ARE US’ says it all. A.G.R.